Fast-moving, and very noisy, comedy. The accident-prone Lyons family move into their new rented house in London, but they have not yet been given the lease. Their efforts to impress the landlord, Mr. Hemmingway, are not altogether successful and result in a catalogue of misunderstandings, chaos and destruction! 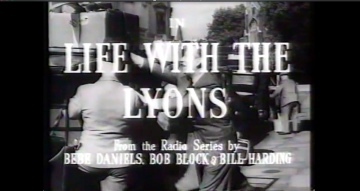 The Lyons family were immensely popular with radio audiences in their heyday and the success of this film led to a sequel, “The Lyons in Paris” (1955), also from Hammer. This was the first film for Hammer directed by Val Guest, whose later work for them includes “The Quatermass Xperiment” (1955), “Quatermass 2” (1957), “The Abominable Snowman” (1957) and “When Dinosaurs Ruled the Earth” (1969).